Behold Moonrise on Bologna. 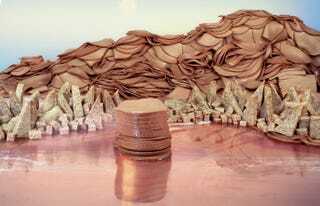 It's part of a series entitled "Processed Views: Surveying the Industrial Landscape" by midwestern artists Barbara Ciurej and Lindsay Lochman; the two have use junk food to recreate Carleton Watkins' 19th century landscape photos of the American West. According to the artists, the series (which also includes works entitled "Deep Fried Bluffs," "Flamin' Hot Monolith," and "Fruit Loops Landscape," the latter seen below) "interprets the frontier of industrial food production: the seductive and alarming intersection of nature and technology. As we move further away from the sources of our food, we head into uncharted territory replete with unintended consequences for the environment and for our health." Of choosing Watkins as inspiration, they note, "his images upheld the popular 19th century notion of Manifest Destiny – America's bountiful land, inevitably and justifiably utilized by its citizens. We built these views to examine consumption, progress and the changing landscape." View the entire series at the artists' website. Who's hungry?